A native of Eugene, Oregon, Angie moved to the East Coast to play softball at Georgia State University. During her four years on the mound at GSU she pitched 70 complete games and compiled 15 shutouts. She holds individual season records for strikeouts and shutouts and received Atlantic Sun/TAAC All- Conference honors in 1999 and 2000. 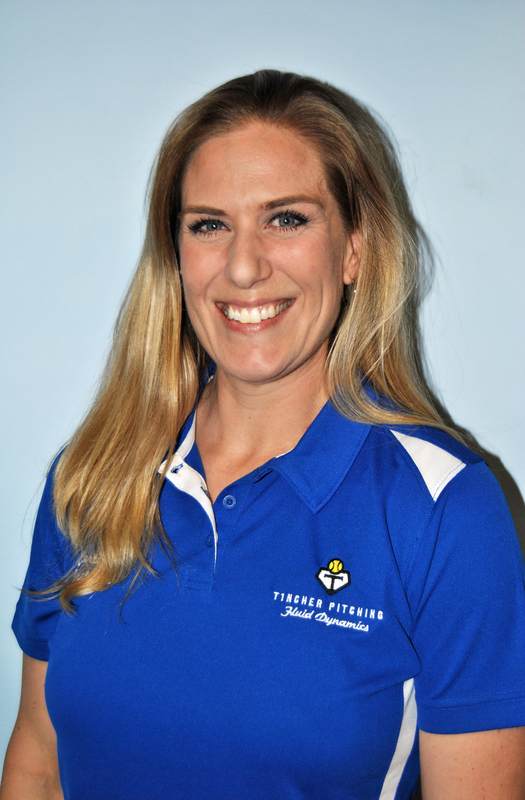 Angie has given private and group pitching instruction for over 15 years in Georgia and Oregon. She holds a Bachelor’s Degree in Sociology from Georgia State University and a Masters in Business Administration from Ashford University. Angie is currently a full-time pitching instructor. She is also a Level-1 CrossFit Coach at CrossFit Tucker and a NASM Certified Personal Trainer. Unlike most of the instructors who first meet and begin shadowing Denny, I was forewarned his methods were a little “out of the box”. As a former Division I pitcher and college coach, I am intrigued by different pitching approaches. I jumped at the idea of learning the Fluid Dynamics approach to pitching and was eager to see what it was all about. Denny’s extensive research on the biomechanics of the female body including how to create and transfer energy just makes sense. Best of all, once taught it often feels effortless to pitchers. As a pitcher who learned to throw using pure muscle(including a jerky motion and closed hips), I was able to get away with these mechanics because of my 5’10” build and strength. Now that I have a better understanding of the biomechanics of the pitching motion for female athletes I am able to use my experience and Denny’s research to enhance the performance of my students. One of the biggest differences I see in the pitchers I coach today is their confidence. It is amazing to see a pitcher realize for the first time her arm circle has the ability to go much faster, or she can stride an extra six inches, and interestingly the pitchers often do not realize their speed has increased because it felt so easy. Perhaps one of the things I love the most about Fluid Dynamics is the broad education. Not only are the pitchers learning throughout the process but parents, catchers and coaches also learn the specific cues, why the body works the way it does and what to look for during practices and games. I am excited to see how Fluid Dynamics takes softball pitching to the next level. It is exciting when someone who has been a college coach and pitcher decides to study Fluid Dynamics. It wasn’t long before we knew Angie was going to be part of our team. She has a wonderful ability to assess kids and get to the root of the problem. Her mind is always working and she spares no effort to help pitchers achieve, both with their mechanics and mindset. Experience in all parts of the game helps pitchers feel that Angie is someone who can help them reach the next level.